July 6, 1999 . . . . I cut the scarf joint (15° angle), flipped the peghead piece over, and glued it to the neck shaft (after first refining the surfaces on the belt sander). To the right is the face of the peghead end (I haven't yet sanded it smooth). 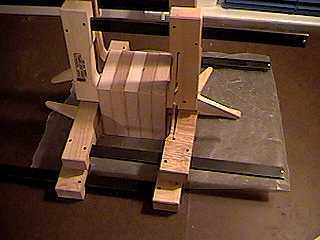 Gluing up the five 4" pieces for the heel block. 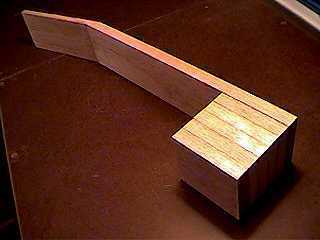 How the heel block will be glued to the neck shaft (not glued yet). July 16, 1999 . . . . 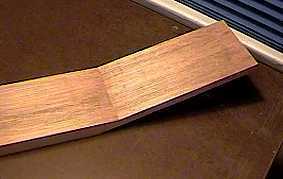 I have routed the channel for the Martin-style double-acting truss rod (available from Luthiers Mercantile). 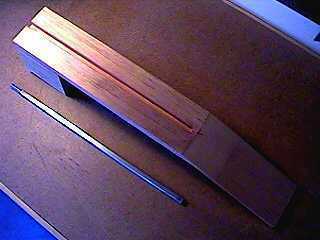 The truss rod will be accessible through the soundhole. I kind of messed up here . . . . . can you tell how? Look closely . . . . Can you see it now? (I hope not!) 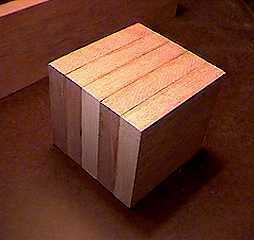 Well, what happened was, when I routed the channel, I ended up with the channel being a bit too wide for the truss rod (I'm new at using a router). 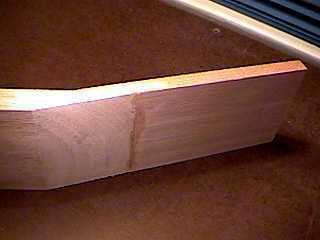 What I ended up doing was gluing in a piece of 1/32" mahogany on each side of the channel. When I put the truss rod in now, it fits perfectly (lucky me!). 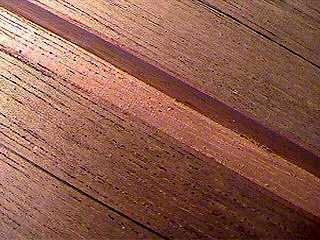 When I glue the truss rod in later, I will use epoxy and a very thin mahogany filler strip on the top.